The AEGEEan’s Choice Awards – Adding the ‘Thematics’ To Events! Three Spanish and two Polish locals compete for the award to the Best Thematic Event of The AEGEEan’s Choice Awards. All of them have cooperated with several projects and organisations in order to bring a thematical taste to their events, which have proven to be a great success. You will hear the final result in Agora Patra – meanwhile, we invite you to get to know the nominees! To start with, AEGEE-Las Palmas was awarded as the Local of the Month the past November for the YVote2014 Convention on the EU Democratic Gap. The Canarians have shown that, despite being a small antenna, they can bring high-quality events to their city and have a big impact not only in the AEGEE network, but also on their local media. The AEGEEan has interviewed Carmen Martín, main coordinator of the event. The AEGEEan: Could you tell us briefly what was the event about, and which were the main activities? Carmen: The event was about the YVote2014 Project in general and specially about “Bridging the EU Democratic Gap”, which means to try to fill in the existent gap between Brussels and peripheral areas as Canary Islands, whose inhabitants don’t feel sometimes really European, because of the distance between our island and the rest of Europe. You cooperated with the YVote project, how was the collaboration with them? It was great, actually really fluid, with a lot of Skype meetings in which most of people in charge were present and with an open communication. AEGEE-Las Palmas team did not know all the members of YVote team, but that was not a barrier; we worked easily and efficiently all together. Which were the biggest challenges of organizing the event, and how did you solve them? Actually there was only one challenge, and it was related to Youth in Action grant, which arrived to AEGEE-Las Palmas bank account during the event (and we really had to make magic and ask for money to pay what we had to pay in advance). Everything else was really easy; the cooperation inside AEGEE-Las Palmas team and between us and YVote team, the great and motivated participants that we had, the organizational staff related to the hotel and sponsors… I would organize this event again thousands of times! And which were according to you the best things of organizing this event? The best things for me were, first of all, my team; they really made everything way easier to me, and we grew up as a team, seeing that everything was possible with open communication, a good mood and people who understand you and appreciate you. Second; our relationship with our University, City Council and other sponsors improved a lot (they could see that we are also able to organize other more ‘serious’ events, rather than just fun Summer Universities). Third: We got a lot of visibility in our city; we were on the news one of the days and in three different radio interviews. Furthermore, we got to know people from other associations and Europe Direct, with whom we made a great net of contacts for future events. Why do you think you should win the Award to the Best Thematic Event? Well, I am sure many other antennae organized great thematic events, but from my point of view, I will try to explain why I think AEGEE-Las Palmas should win this Award: Because even if we are a young (five years old!) and small (31 members) antenna, we manage to motivate our members to stay active both at the local and European level, to organize important and serious events as this one and because the event was just perfect from all the points of view: I’ve been told this from organizers’ side, participants’ side and YVote team’s side, so what else could I add? If we all agree on this, I think the rest of the Network should know about it! On the other hand, AEGEE-Kraków organised last year the AEGEE Model of United Nations, which consists of a simulation of the discussions and procedures taken within the UN, as if they were delegates of their Member States. Katarzyna Michalska, main organizer of the event, explained to The AEGEEan how the MUN was. Could you tell us briefly what was the event about, and which were the main activities? AEGEE Model of United Nations was an international United Nations simulation conference during which participants played the role of UN Member States delegates generating a common approach on major issues of international politics. During the three days of meetings, divided into a few sessions, the participants discussed, following the official procedure, the different ways of solving one of the actual international conflicts in order to create a resolution which would be compatible with the ideas of Human Rights and Peaceful Conflict Resolution. As delegates of the UN Members States or Observer States, they did their best to defend the position of the state which were representing. The project consisted of two simulations of United Nations meetings: one on the conflict in Mali and one on the issue of the rights of North African refugees in Europe. First of all, we decided to organize an international event in which we had no experience. It was difficult to create something totally new and unknown for us but, as we love trying new things, we took on this challenge with no fear. Fortunately we managed to find our experts – people experienced in the field of United Nations simulations who were available for any questions and concerns we had during preparation and also conducted our conference making it as professional as other prestigious events this type. Another challenge we had to face was the lack of funding sources. We had limited budget but we were so determined that even until less than week before the project we were struggling to get funds from many sponsors and finally got enough money! Moreover we had some difficulties in finding suitable place for the project but luckily we had a huge support from the university authorities who gave us an opportunity to organize it in one of their institutes. For me one of the best things of organizing this event was the great pleasure of doing it! Working with inspiring people who were truly motivated and dedicated to the project gave me a lot of energy and made me enjoy every single moment of organizing the project as well as the event itself. Beside the amazing team, I’d mention all of our small achievements which contributed to our final success, such as establishing valuable partnerships, getting funds or finally finding out about the surprising number of applications for our event! I can proudly say that thanks to hard work and determination of my team all the goals we set before organizing this event were achieved. We wanted to create a unique interactive learning experience which young people could enjoy and benefit from at the same time. What is worth mentioning, our project distinguishes itself by its up-to-date topic. It aimed at spreading and sharing knowledge about the problems of the modern world and the role of the United Nations in solving them as well as giving the participants opportunity to develop their diplomatic skills of compromise, negotiation, understanding of foreign affairs. Our goal was to encourage to study and discuss the issues of global importance. The positive feedback we got from the satisfied and happy participants eager to take part in the next edition of the project strengthened our belief that our event was a big success that we should be proud of. AEGEE-Zaragoza is also nominated in this category. This time, by hosting the EuroSD – European Structured Dialogue conference, which gathered several International Youth Organizations in order to draft a joint statement to be sent to the European Commission. It was the first time that this consultation process was taken at a European level, as Beatriz Nasarre, former president of AEGEE-Zaragoza, explains. The event was a European conference about the Structured Dialogue (It is a process of consultations launched by the European Commission and the European Youth Forum in order to pinpoint the needs and concerns of young people from all over the European Union), that gathered over a dozen International Youth NGOs. Besides writing the recommendations and a joint statement, we organized city tours around the city, and also a press conference where we transmitted that we would like the voice of young people to be heard. You cooperated with other student organisations and AEGEE-Europe, how was the collaboration with them? It is always very positive to strengthen the cooperation with other youth associations from outside AEGEE, whether they have a similar profile as us or not. It makes us see the things from another point of view, and it is always very rewarding. The people attending events like this one are always interesting and gratifying to work with! Feeling part of such an interesting project, being “the first ones” of organising such an event, and especially feeling proud of the work we did. As always, with lots of works and nerves from the organisers, the feeling when the participants congratulate you because they have really enjoyed the event has left us speechleess. And, of course, proud of being able to wear such an awesome t-shirt designed by our Uncle Joni! Well, first of all because… have you ever seen such an awesome logo and t-shirt!? The event was a whole success and the thematics of the event were really interesting – with this European Structured Dialogue consultation we can really make an impact in the European Commission. Besides, the organisers devoted an important amount of their summertime, so we should definitely win – anyway, thanks to The AEGEEan for nominating us and we wish the best luck to the other nominees! We wanted to show to our participants how beneficial, easy and fun can be having a healthy lifestyle and how to achieve it with some little changes in their day-to-day habits. That’s why we tried to make them used to a Mediterranean diet and to keep a daily routine of exercise. The main sports activities we organised were a yoga and a zumba class, both early in the morning at the beach with professional trainers, as well as a walk on the sand, and some outdoor games. We also had the chance to hold a first aids workshop and to visit a ecological vegetable garden run by local farmers. You cooperated with the Health4Youth Project, how was the collaboration with them? They are very kind, three of their members (Maria Arends, Sygrit Andringa and Elmar Guliyev) came to the pre-event to give a hand with the programme by conducting some very successful workshops, such as the one about the effects of the consumption of alcohol on your body, and the one about the effects of not sleeping properly well. We programmed to spend the last day and night on a camping site hoping that the sun will stay out the whole event (we are in Alicante, it never rains, but when it does, the whole sky falls down! ); so just in case we were aware of the weather cast, which unfortunately turned out to show lots of cats and dogs planning to rain that day. We had to reschedule the programme, and that means: not camping and staying in the hostel (luckily for us not booked), cancelling a bbq and the goodbye party in the countryside, and replanned the whole last day at the very last moment just the day before. We contacted an ukulele teacher who improvised an amusing lesson for beginners, then, we went up to visit the Santa Barbara’s castle and in the evening we participate in an international beer pong contest. So it actually went pretty well taking into account that none of this was planned. The other big challenge was to cook every meal and make it with a huge presence of vegetables. A wide range of tasteful dishes, from couscous to guacamole, including paella and vegan burgers, to name but a few. After the event took place, we collected all the recipes in a cookbook which can be download from here http://goo.gl/mw6wio Readers, feel free to use it and to send us comments afterwards! And which were according to you the best things of organizing this pre-event? Maria Teresa: Everything! I love the cooperation between the organisers and with the H4Y team. The organisational capacity that we had. It was my first event as organiser, and I learned a lot about AEGEE, and about my antenna. I’m very proud to have been part of that effort. Isa: Choosing participants is usually a bit like playing the lottery, and definitely that time we hit the jackpot: we got such a great group of pleasant participants! Moreover this event was also useful for the antenna to activate some new local members and I am personally interested on the main topic of the event, so it was great that we carried it out, and even more, as a pre-event of ZarAgora! Melissa: I didn’t know anything about AEGEE and I didn’t know anyone, so when I knew about this event, at first, I was attracted by its programme, and then, I had the opportunity to go as helper and I tried to do my best. We showed to all the participants the best things of our Mediterranean lifestyle in a great atmosphere and everything went perfect! For me, it was an incredible experience and the perfect chance to know and realize how amazing AEGEE is. 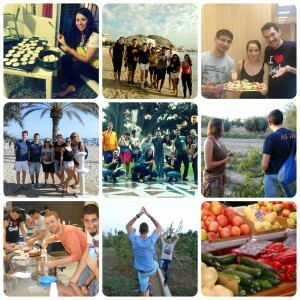 After this, I felt in love with the AEGEE spirit and now I can’t imagine my life without it! Even if it was a small one (in days and in number of participants), it was one of those events in which once it’s over you can feel that, despite of the unexpected changes, everything went well. After the last dinner, still sitting on the table, some participants started to thank us spontaneously for the atmosphere, the organisation and the activities of the event, they said that they really felt like they were at home. Once they went back home, they kept sending us lovely messages and Elmar (AEGEE-Bakı and Fundraiser of the H4Y Project) even made a cute video http://youtu.be/im9xOYW5eM8! They made us feel that this event was not only a H4Y event, but also an event about friendship, fellowship, teamwork, solidarity, and lots of AEGEE love. 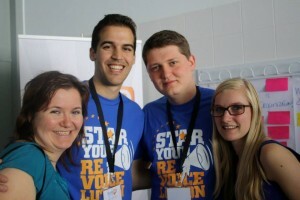 AEGEE-Poznan was also nominated, in cooperation with the Eastern Partnership Project, by their I’m for East! Festival. The AEGEEan has contacted them in order to know more about their event – so stay stuned in order to hear their responses! And remember, you still have a few time to vote: it is YOUR choice!